A picture ought to be about something. One of the differences between painting up until the middle of the 19th century and what followed is that pictures, for the most part, ceased being about something literary and became about things purely visual. The subject of, for example, Delacroix’s Liberty Leading the People to Victory was the triumph of the 1830 revolt against Charles X, or about the triumph of freedom in general. Liberty told of events and the human condition. Jean Francois Millet, similarly, painted haystacks as a comment on farm life. But haystacks can be contemplated in other ways. Monet and his colleagues took the subject matter surrounding them and used them as an evocation not of life or the human condition, but of the very act of seeing. It would be tough to imagine a more dispassionate rumination on haystacks, or of anything else. With the French Impressionists came an exploration not of what we see, but how we see. The change, and the work these people did, are so familiar to us now that it’s easy to overlook what an overhaul this was in how pictures were conceived and executed. Subject matter and its overtones became pretty much irrelevant. Hawthorne famously taught his students that the loveliest motifs were the ugliest ones. He loved sending his pupils to railroad yards. The poetry to be sought wasn’t in what things were but how they appeared on the retina of the eye. It’s a very different sort of way to conceive pictures, and it’s fallen out of fashion over the past decades. But it’s still a legitimate way of building paintings. I find it very much worth pursuing. For example, last Saturday I blundered on this scene. There’s nothing in the way of literary content here, no genre subject to explore, although in fact I was standing in a farmer’s market, which could well have offered a human story to tell. This was it. The zigzag formed from a mound of land, its diagonal descent, and the flat plane surrounding it, framed by three trees, was the story, if you could call it a story. Anyone who’s painted landscape for any length of time will soon get bored with a horizontal ground plane, parallel to the lower border of the canvas. One searches for some relief from it. And here it was, my zigzag. It, the trees framing it, and the cloudscape above, where what I wished to describe. Not a profound comment on the human condition. Just something that looked cool. I went at it. Ninety minutes later, my 18x24” canvas was covered. An hour or two, generally, is as long as an effect is going to last, so unless your visual memory is superb, you have to limit your work time each day. The shadow of passing clouds on the foreground was something I wanted and waited to see, although the shape and the edges of this shadow are somewhat vague. The blue of the distant trees on the left are really unseen on the right, but its lack looks strange; i would have to invent a line of distant trees on the right. If you’re smart, you’ll learn to love day one. I loved this one. When I was done, I packed up, went home, and left the canvas on the dashboard of my truck to bake in the 88º sunshine of this Indian summer day. That night, the paint had set, and I scraped it all down with a palette knife, to bring about a dry and cooperative surface for the following sessions. Two days later I returned. Same time of day, roughly the same conditions. My target, again, was the zigzag ground plane. I noodled with the sky some, but had decided that its lines and shapes were what I wanted, so I only made some minor adjustments to values and hues. Day Two can be very difficult. The visual impression which one rapidly and uncritically recorded must be refined and clarified; otherwise, why go back at all? But the energy of the first lay-in is extraordinarily easy to lose. As you can see, I did add that distant treeline to the right, and I made an earnest effort to describe the topology of the land whose zigzag I so wanted to describe. But Day Two was disheartening. I didn’t like the ground and wasn’t terribly thrilled with the sky which, after all, was assigned the largest real estate in the canvas. Autumn effects are fugitive. The scene might look about the same for another day, but that’s about it. The weatherman believed that tomorrow there’d be one more warm sunny day. I could either try to get it then, or stick this thing in the attic, to await another attack in October of 2019. When the next day came, I had to make a decision: do I chase after my zigzag ground plane, or do I just go after what my eyes saw that day? I chose the latter. My ground plane was sacrificed to the sky before me, which I painted rapidly. If we’re speaking of the fine art of upstaging, that’s what happened here: the sky, which had been cast as a supporting player to a zigzag land mass, became the star. Like the ingenue in The Wisdom of Eve, my sky took its understudy role, ran with it, and upstaged the ground. 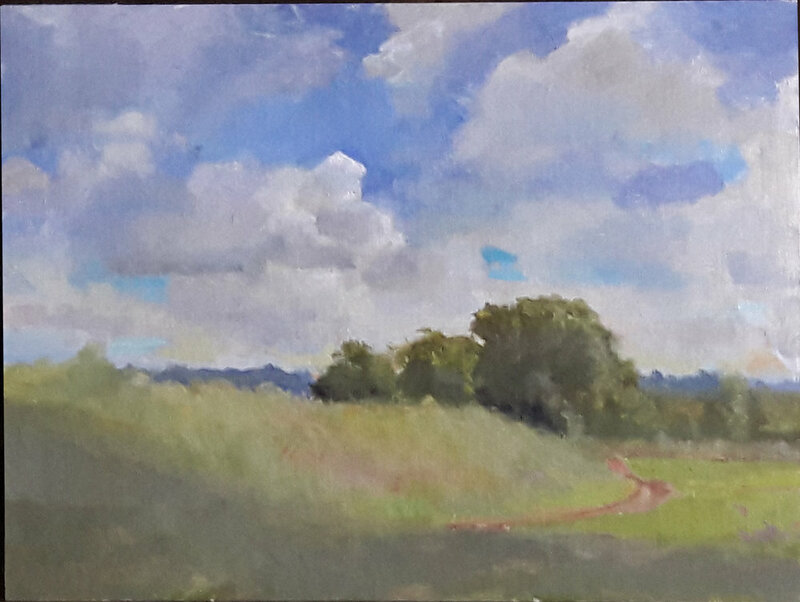 I’m more and more convinced that in order to paint a cloudscape, one must find one point of focus, one finely seen cloud, and let everything else fall out of focus. I believe that this is one of the secrets of a well-painted sky. Clouds are huge, and the eye cannot focus on more than one of them at a time. Nor are all clouds equally crisp to the eye. Usually only one is, usually to be found a few degrees above the horizon. I selected one cloud as the star, the crisply painted one directly above the leftmost tree. I drew it the best I could, and spent the rest of my time finding ways to lose the outlines of the others. The picture got some nice comments on social media. It’s about as good a sky as I’ve ever managed to paint. But the aging diva it upstaged, my zigzag ground plane, was the casualty.